Hong Kong, geologically a submerged highland area, is a deepwater port in Southeast China, with an area about 1100 km2. Most of the 7.0 million of population dwell in Hong Kong Island, Kowloon Peninsula and flat land in the New Territories and outskirt islands. Metropolitan development covers near half of the area and the rest half hilly area is designated as country parks. Immediately after the Opium War Hong Kong was occupied by the UK in 1841 and was ceded by the late Ching Dynasty of China to Britain in 1842. Kowloon Peninsula was ceded in 1860 and the New Territories was leased for 99 years since 1898. Pursuant to an agreement signed by China and the UK on 19 December 1984, Hong Kong became the Hong Kong Special Administrative Region (SAR) of China on 1 July 1997. In this agreement, China has promised that, under its "one country, two systems" formula, China's socialist economic system will not be imposed on Hong Kong and that Hong Kong will enjoy a high degree of autonomy in all matters except foreign and defense affairs for the next 50 years. Basic Law approved in March 1990 by China's National People's Congress is Hong Kong's "mini-constitution". After the repatriation in July 1997, Hong Kong will remain 50 years of no change to the previous common law legal system. Hong Kong is now a Special Administrative Region of China. The Land Registration Ordinance was first enacted in 1844 and continued to be in force to this moment. It is an English system of deeds registration for transaction. Land parcels are disposed through auction, tender and private treaty grant such that land rights are held in leasehold, except an Anglican church which enjoys a freehold title. Land boundary right, like any other rights, is to be traced from the attached plan and content of the lease or other land grant document. The boundary system is only designed for the Identification of the location of a parcel. An easy and traceable transaction is purpose of the original design. The Housing, Planning and Lands Bureau steers the government policy on land use, land supply, property development, public and private housing, building regulations and so on. The Lands Department is responsible for the administration of the disposal, acquisition and management of land, and the Survey and Mapping Office (SMO) is one of the three functional units under the department. SMO is the custodian of land boundary record for the government and its head is assigned the Land Survey Authority under the Land Survey Ordinance. Many land related data are kept by different departments, for examples, Planning Department keeps the legal land use data, Rating and Valuation Department keeps real property valuation data, Land Registry keeps the register of deeds and so on. After the enactment of Land Survey Ordinance in 1996, Authorised Land Surveyors (private sector) takes up the bulk of cadastral surveying services which include the subdivision, re-definition old lot boundaries and setting out of boundary points. The Survey and Mapping Office accepts submission of boundary reports from Authorised Land Surveyor and Registered Professional Surveyor. There exists a three-tier structure of land surveying professional organizations. The Hong Kong Institute of Surveyors (HKIS) is the professional organization for surveyors and the institute is incorporated under ordinance Cap 1148. The ordinance Cap 417 forms the Registered Professional Surveyors and the ordinance Cap 473 forms the Authorised Land Surveyors. A land surveying division corporate member of the Hong Kong Institute of Surveyors may apply for the Registered Professional Surveyor after one year of local practice and Authorised Land Surveyor after one year of local cadastral surveying practice. Both registration boards are formed under the Professional Surveyors' Registration Ordinance and Land Survey Ordinance respectively. Authorised Land Surveyor needs to renew their annual practice license from the Survey Authority. Current applicants to the Land Survey Division of the HKIS needs a land survey degree from the Department of Land Surveying and Geo-Informatics or any other land surveying degrees which is acceptable to the Royal Institute of Chartered Surveyors in England. Hong Kong produces in average 40 geomatics degree holders per year. Hong Kong cadastral system deals with basically land registration and cadastral survey. The contemporary exercised cadastral system started when Hong Kong became a British colony in 1842. It is a leasehold registration system. As defined in the Land Registration Ordinance (1844), the purpose of cadastral system is mainly for the transaction of land ownership, and has remained largely unchanged since then. Hong Kong emphasizes free trade and positive non-interventionism policy. Several core cadastral functions like recording and securing property rights and land boundary rights remain legally unimproved under the operated deed registration system. With the continuously development information and communications technology and steady investment on survey and mapping infrastructures, the current cadastral system progressively realizes its multi-purpose capabilities to support decision making in various fields (e.g. valuation, land development, land planning, utilities management and others). Leasehold land grant under a deeds registration system is the dominant cadastral mode in Hong Kong. In 2004, Land Titles Ordinance as a parallel registration mode was introduced. Land Registry plans to convert the existing deeds system to titles system upon the commencement of the Land Titles Ordinance. As at 2012, a “Two-Stage Conversion Mechanism” is being considered and continuing discussions with the stakeholders are being held. There is no Cadastre Law in Hong Kong. The deeds registration system is the prevailing method for land registration. The land register is only an index of the registered documents. The property may be subject to unregistered interests. 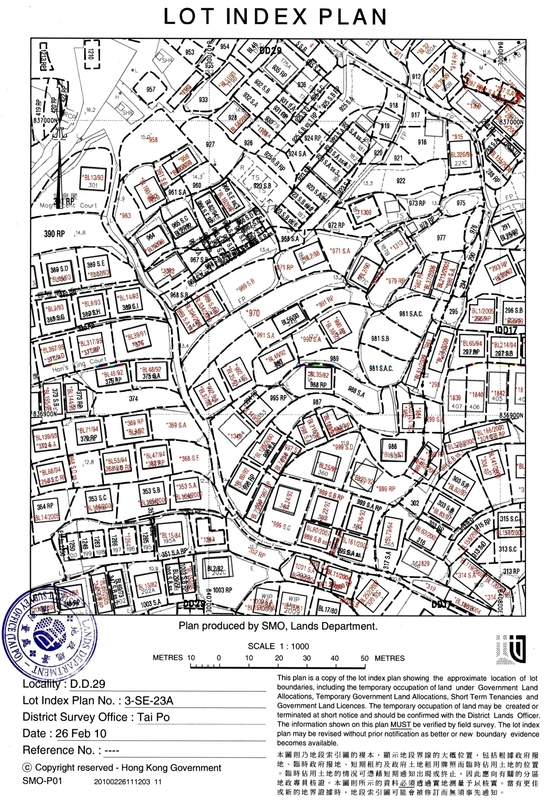 The basic unit in the cadastral system is a land lot. Building units are registered as an exclusive use right attached to an undivided share of the land. Other land rights as well as boundary rights have to be traced back to the original grant document. Condominium units are registered as non-divisible shares of ownership of the lot. Adverse possession is allowed. To acquire a title by adverse possession under the Limitation Ordinance, it takes 12 years for private lots and 60 years for government land. Approximate 300,000 land lots in Hong Kong are all properly registered and surveyed. Land Registry in charges of registration activities, and the Survey and Mapping Office of the Lands Department maintain the cadastral survey records. The document kept by the Land Registry, including the register, memorial, government lease and land grant document, are the basic legal textual components. The land register and memorial are kept in database and lease documents are stored in scanned image files. Other government departments keep land data without direct cadastre related law prescription. Examples like the Survey and Mapping Office keeps the graphic components (land boundary records) of a cadastre. Planning Department keeps the land use designation data. Rating and Valuation Department keeps the property valuation data. In 1989, the Survey & Mapping Office of the Lands Department set up its Land Information System using ARC/INFO as its basic application software. This Computerized Land Information System (CLIS) aims to convert the existing 1:1,000 maps into digital base information. The conversion work was being carried out by Bureau Service and was completed in 1996. The digital map features are separately coded thereby enabling selective retrieval and display in definable colors and symbols. Basic Mapping at scale 1:1,000 covering the developed areas in the territory. Land Records Plans, which show the locations of all land lots and land disposal proposals. The System comprises three main application sub-system: the Basic Mapping System (BMS), Cadastral Information System (CIS) and the Geographic Information Retrieval System (GIRS). There are 15 layers of geographical features maintained in the map library of the BMS. The CIS maintains the land boundary record database, facilities the preparation of cadastral plans and answers inquiries on land status. There are many types of land disposal and different standards for recording their positions. Temporary land parcels occasionally overlap due to their different development schedules. To record all different types of land parcel boundaries to meet land administration needs, a total of 33 data layers have been created in the CIS map library. The GIRS supports the BMS and CIS and has been developed to facilitate access to both the graphic and textual information of an area via a number of identifiers, such as the house address, building name, street intersection, lot number, planning zone unit and geographic coordinates. Generally, the textual attributes are stored with some of the graphic data in the CIS data layers. Besides using the textual data of the CIS, data layers can be used as identifiers for information retrieval. Three special data layers, however, derived from the BMS data layers are also maintained in the GIRS for spatial inquiries. Many house lots have been left as block numbers and have not been annotated in the Lot Index Plans. It must be emphasized that these are internal records and are not intended to be the sole definitive records of boundary definition. Field verifications need to be carried out for land administration actions of individual house lots. Lot Index Plan serves as a de facto land boundary record which is popularly used by the general public as well as professional land surveyors. Digital and hard-copy detailed maps, scaled from 1:1,000, 1:5,000, 1:20,000 and others, provide updated and reliable spatial information for all sorts of social and engineering activities. Land related data are kept by various government departments and public utility companies. The Hong Kong Government is still in an initial planning stage to form a regional spatial data infrastructure. Hong Kong cadastre functions well in transaction, however, it is less secure in protecting other land rights, especially land boundary rights. The Land Registry has tried to adopt a titles registration system in parallel with the existing deeds registration. The Titles Registration Bill is expected to become an ordinance in the near future. The Hong Kong Institute of Surveyors proposes a systematic re-survey of all the land lots in New Territories. The cost of this project is estimated at 240 million US dollars or 1,200 US dollars per lot.